« Program for the D. A. R.
As I am wont to do from time-to-time my morning began with coffee and a Google search in hopes of finding some new and interesting bit of relevant information to post. Thank you, Google! Paydirt! Up popped a short article, John Bulls in the Orange Groves, by Paul W. Wehr, from the summer/fall 1979, Journal of the USF/Library Associates. Colony #2, Wehr says, was located south of Zephyr Lake. Fruitland Park was founded by a Major Rooks of Georgia who also offered to train young men in the citrus industry. It is said that the agent for that enterprise toured England persuading families to send their younger sons to that agricultural school. The families were expected to pay a sum of money to cover the cost of tuition and of transportation, reportedly in the cramped quarters of a freighter. Upon arrival those apprentices found not dormitories and farms but rough shacks and a virgin wilderness. Conditions became so difficult for some that they were seen ploughing [sic] in the dress suits they had so carefully carried with them so they could be properly attired on social occasions. Mercy! 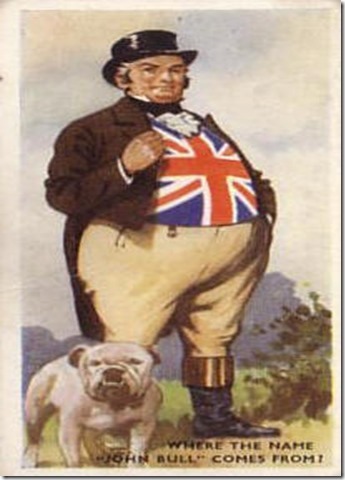 John Bull represents the drinking, hard-headed, down-to-earth, fond of dogs, horse, ale and country sports kind of man—characteristics typical of the men of Chetwynd. But, as now known, not physically although I must admit that when I first began my research of Holy Trinity’s history I was convinced the founders were curmudgeons with pork chop sideburns—just like John Bull!